NEW WILMINGTON, Pa. (WC) – Brass musicians of all ages are invited to attend Westminster College’s 2018 Brass Extravaganza from 9:30 a.m. to 4:30 p.m., Saturday, Nov. 10, in the College’s Will W. Orr Auditorium. The event is open to anyone who plays a brass instrument, any age and any level. The general public is also invited to attend the performances scheduled throughout the day. In addition to performing, participants will also enjoy masterclasses and guest performances. 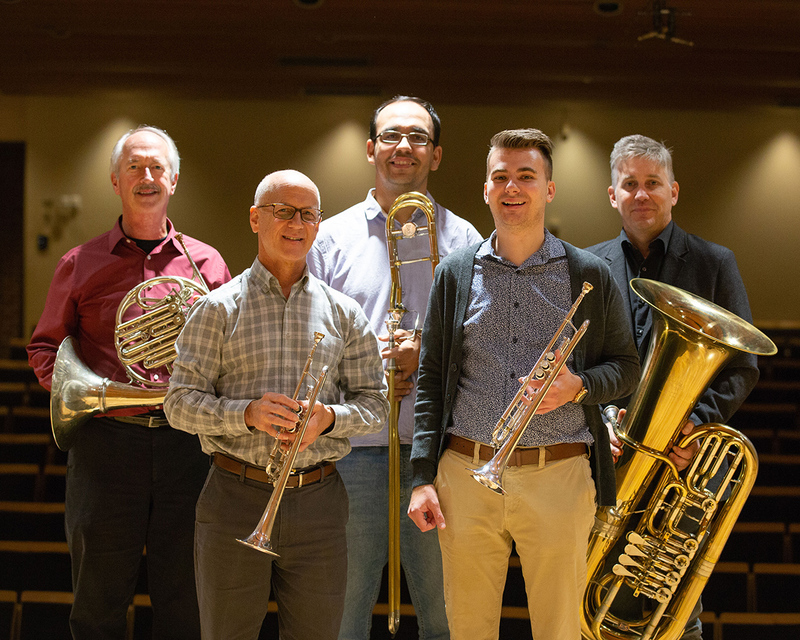 The Westminster College Faculty Brass Quintet will perform various compositions for brass quintet and offer a brass chamber music masterclass at 10:30 a.m. in Orr Auditorium. The quintet consists of Dr. Timothy Winfield, assistant professor of music, on trumpet; Dr. R. Tad Greig, professor of music and director of bands, on trombone; H eather Johnson, adjunct music professor, on horn; Bob Antonucci, adjunct music professor, on tuba; and Terry Gale, professional regional musician, on trumpet. Dr. Rachel Hockenberry, assistant professor of horn at Illinois State University, will present a masterclass titled, “The Healthy Musician: Staying Physically, Mentally and Emotionally on Top of Your Game,” at 11:30 a.m. in the Orr Auditorium mezzanine. Tubist Dr. P. Blake Cooper, a faculty member at California State University, Northridge, will give a recital performance at 1:30 p.m. in Orr Auditorium. OhioBrass, the faculty brass quintet in residence in the Ohio University School of Music, will perform at 3:30 p.m. in Orr Auditorium. The group consists of John Schlabach, trumpet; Zachary Peaslee, trumpet; C. Scott Smith, horn; Jason Roland Smith, tuba; and Lucas Rego Borges, trombone. A minor Tune Up Brass Repair will be on site throughout the day for repairs and ultrasonic cleanings. The day is free and open to the public. Lunch will be provided, as well. For more information and to register, visit www.westminster.edu/music or contact Dr. Timothy Winfield, assistant professor of music at 724-946-7274. Photos from top left clockwise: Westminster College Faculty Brass Quintet; Dr. Rachel Hockenberry; OhioBrass quintet.